A pair of imagined orbiting space colonies. Image by Rick Guidice, NASA Ames Research Center. Sometime this century the number of humans living on planet Earth will peak. This is unprecedented — outside of particularly destructive plagues and wars the human population has continually increased throughout history, and only in the last decades of the 20th century have birthrates fallen enough to slow the rate of population growth in some regions. This peak will be a watershed event in human history and will have enormous impacts on our civilization, some of them unexpected. The idea of an eventually slowly declining human population is one we’re not familiar with, and is one some of our basic assumptions about the future really aren’t compatible with. One of these assumptions is the human future in space- it’s commonly taken as a given that in the next centuries humans will spread throughout the solar system, colonizing unfamiliar worlds. Unfortunately for science fiction fans, this doesn’t seem likely. 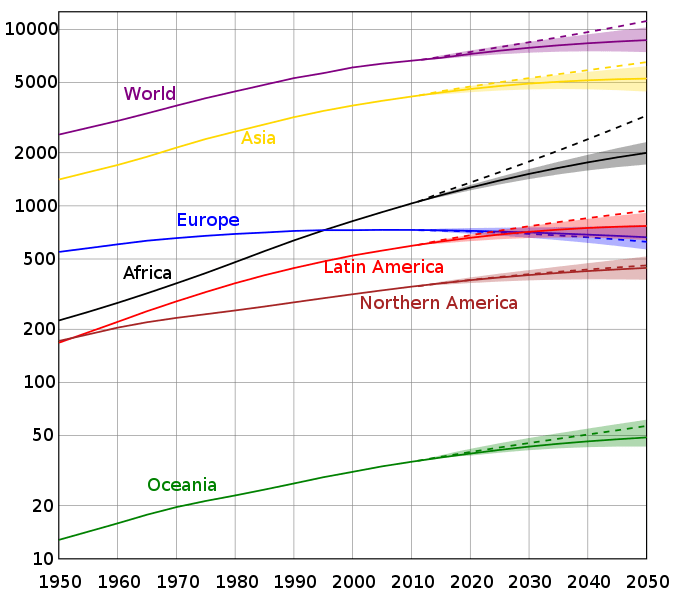 Population growth rates by region, to 2050. Solid lines represent median variant. Image by Wikimedia user Conscious. Human population forecast to 2300. Source: United Nations, World Population in 2300. These trends aren’t mysterious — it’s evident that societies’ birthrate reductions are strongly tied to increases in personal wealth and female education. This trend extends across cultures; Europe and East Asian societies, cultures that have historically valued large families but otherwise shared few cultural traits, have both seen precipitous declining birthrates in the last 20 years. This strong link between private wealth and fertility rates suggests that a prosperous, stable future could see an unprecedented slow fall in the human population and discredits predictions of continued runaway populations growth. The demographics behind these forecasts are established. What’s more interesting, and less commonly explored, is what a future of a slowly falling population will look like. The Earth will certainly remain a very crowded place- even optimistic predictions of future average fertility put a steady global birthrate just under what’s needed to maintain a stable population, implying a population over 8.5 billion in the early 23rd century. Science fiction writers have always assumed that humans would settle throughout the solar system. The theme is familiar: scarce resources on a crowded Earth lead brave explorers the settle Mars, the Moon, and to create fabulous cities in hollowed out asteroids inhabited by millions. This imagined future is so common that it’s almost taken as a given: people assume that in the future a good portion of humanity will reside off the familiar ground of Earth. But this type of prediction doesn’t hold up in a future of falling birthrates. 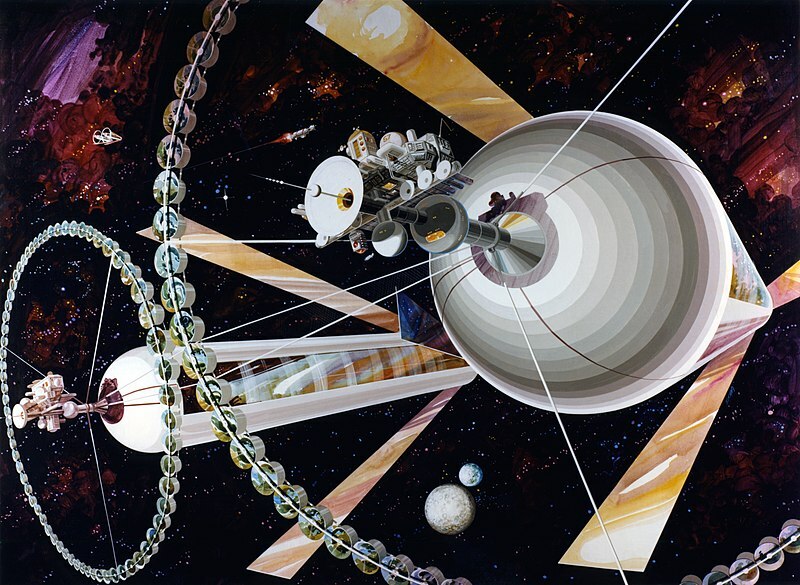 The barriers to this vision of space settlement isn’t technological. Humans probably will have the propulsion and robotic technologies necessary to create asteroid habitats this century, and it’s probably safe to bet on the emergence of the types of fusion propulsion systems necessary for reasonably quick travel throughout the solar system in the next two hundred years. However, living outside the familiar environment of the Earth will always be enormously expensive. Even on Mars, whose terrestrial environment is relatively similar to Earth’s and possesses the space and atmospheric pressure to permit reasonably cheap agriculture and habitation, it will always be hugely expensive to house, feed, and protect settlers. The cost on low gravity, vacuum environments like moons or asteroids will be even greater, though somewhat reduced by the ease of escaping small bodies’ gravity well. Ultimately people won’t be willing to bear these enormous costs of settling the solar system unless there is a pressing reason to do so. Science fiction writer have always assumed that the specter of an unbearably crowded Earth would be this motivation. Fortunately, this future looks unlikely. Sure, a planet inhabited by 10 billion increasingly affluent consumers will represent enormous social and environmental challenges, some that may be extremely difficult to overcome. However it is unlikely that the costs of a 10 billion strong terrestrial population will ever be enough to offset the challenges of a significant portion of the human species living off the Earth. If today’s favorable demographic forecasts hold true there simply won’t be enough humans to ever justify investment in significant off-world settlement activity. This doesn’t mean that humans have no future stake in space- the rising affluence of the world’s population is already increasing the demand for rare metals which are found in abundance in asteroids, and it’s hard to believe that increasing scarcity on Earth won’t justify extraterrestrial mining investment sometime in the next few centuries. While intriguing, these robotic asteroid mining operations are a far cry from optimistic vision of future colonies scattered about the solar system. Rationally, this isn’t a problem- despite the attraction of living on Mars, overcrowding forcing humans to leave Earth would probably be a pretty bad thing for our society and really isn’t the most attractive future for humanity. However, it’s hard to not regret that the space colonies of science fiction probably won’t ever happen. Too bad.